[SMTH671] Thomas Smith (born 1839), a labourer, married (at Pilton, 23rd July 1868) [STUB672] Eliza Stubbs (born 1838, see STUBBS), witnessed by John Harris (Eliza's half-brother) and Mary Jane Harris (John's wife). Eliza was the illegitimate daughter of Mary Stubbs, born in 1838 at (is believed) Oakham. Her mother married George Harris in 1839 but then died in 1841. George almost immediately married again, so that from the age of 2, Eliza was reared by her step-father and his 2nd wife. At the 1841 Census she was shown as “not born in Northants”, implying she was born in Rutland. At the 1851 census George showed his step-daughter Eliza as born at Oakham, Rutland. This information is presumed to have been correct, though it is likely that Eliza herself was never told this. At the 1861 census she was a servant with a family at Seaton, and she said she was born at Harringworth (which would have been the only place she knew from her childhood). In all the later 1871 to 1901 Censuses, she stated she was born at Harringworth. However in the 1911 Census, she stated she was born at Barrowden. Eliza in her turn had an illegitimate child before she married, the father of whom was George Goodman, an agricultural labourer of Rockingham who never subsequently married. The child, whilst registered as George Goodman Stubbs, was always referred to as George Smith. James (born at New Farnley, 6th September 1882, baptised at St. Thomas, 18th June 1893), married Harriet Gibson nee Hall. There is no way of knowing who the two children were who died young, but possibly twins in 1876. The family moved from Caldecott to Farnley (c.1872-73), then on to Stanningley in Bramley (1891). Thomas was variously farm labourer and iron foundry labourer. 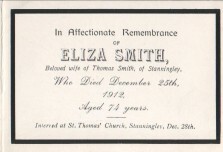 Eliza died (age 74, of senility, though it is believed she choked while eating dinner on Christmas Day) at Stanningley (25th December 1912, buried at St. Thomas, 28th December 1912). Thomas died (age 76, of bronchitis and heart disease) at Armley Workhouse (5th April 1915, buried at St. Thomas, 7th April 1915). [SMTH682] Mary Ann Smith (born 1869, daughter of Thomas) married (at Calverley, 4th February 1888) [SHEP681] James Shepherd (born 1868, see SHEPHERD). ** Being an old age pensioner, did she have to provide a Birth Certificate? a birth around 1838. Unfortunately, it was the wrong Eliza's birth certificate.